Anybody take home-cooked and dehydrated bacon on the trail (Sierras) for a couple of weeks? Or maybe home-cooked and packed in some of the bacon fat (confit)? I've seen the threads about manufactured "shelf-stable" bacon but we are out of time for mail-ordering things. You may not have to order the stuff. Pre-cooked bacon (at least in Canada) is available in most supermarkets. I find it hard to believe this would not be so in the USA. The stuff is remarkably good, and it takes just a few seconds to cook. I use the pre-cooked, unrefrigerated bacon all the time. Usually make sure we eat the whole package the day it is opened. Cheapest at Sam's Club. We use a huge bag of the costco brand. Remarkably good and stable for at least a week. Thanks, I'll see if I can find the shelf-stable locally. (I am not a Costco member but there may be other places.) Sounds like the most practical option. Otherwise I may just try cooking up the bacon, running it through the dehydrator, and packing it in some of its fat to exclude air. (Picked up this recommendation on the John Muir Trail yahoo list.) If I have to do this I'll report back in a few weeks, how it went. Go to the salad dressing aisle – the small bags of pre-cooked bacon are hidden there, with the salad toppings. Also, look in the meat section (the fresh meat). Often there will be a small display of bacon and pepperoni. Same with looking next to the packaged deli meat and raw bacon – stores stick the pre-cooked in odd spots. Works great, and is reasonably stable for a short period of time (I'd give it a week). Dehydrating the bacon cooks it, so no point in doing double duty. 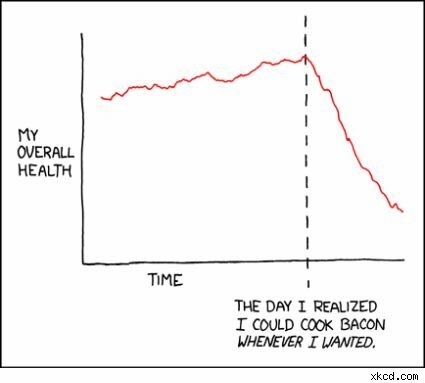 I would also guess that if you cooked your bacon to well done, it would be relatively shelf stable for a week or so. If you're going to make bacon jerky, I recommend thick-cut bacon. I've used the shelf stable stuff, and I can find it in any of the supermarkets here (Safeway, King Soopers, Albertsons, WalMart). The guy in the link said he dehydrated the bacon for 12 hrs at 70 degrees. Was that 70 degC (158 degF)? I find it hard to believe 70 degF is adequate. Elliot… I would imagine it was Celsius as my dehydrator doesn't even go that low (I don't think it does anyway). 70°F is basically room temperature. Just be aware that the CDC statement on safe preparation of pork states: "Curing (salting), drying, smoking, or microwaving meat does not consistently kill infective worms." Pre cooked bacon is excellent. I have taken it on many trips. I also will take th real pre cooked bacon bits to mix in with Mac and cheese or mashed potatoes. Bacon…..yum. Not only is the store bought stuff shelf-stable but I strongly suspect it is a fair bit cheaper than preparing your own. Con-Agra and Hormel buy pork for much less than we can. Here at 60N, the same is true of applesauce and canned tomatoes – they are cheaper than fresh. I'm not saying better, just that I don't fret about the price on some prepared foods versus homemade. Yeah, as others have said, there can be problems for drying pork. Bacon was traditionally salt cured to prevent/slow down spoilage. Like beef jerkey, and other preserved foods (generally now refered to as lunch meats) it should be safe against spoilage IFF properly inspected and cured. However, trichinosis is resistant to most of that. And, it can be transmitted through beef, venison, bear, etc. After curing to prevent spoilage, it still needs to be cooked. These are two separate and distinct processes, though usually combined. Note that this is INTERNAL temp of the meat, not cooking temp. Another rule of thumb is to just remember 165F as a safe number rather than the typical curve. Freezing does NOT reliably kill trichinosis (one type only, not the worst.) Generally, well done is the easiest to be safe. The term measly is used to describe meats infected with trichinosis worms/cycts, though it can also be used for maggots on meat. I prefer to carry bacon uncooked on the trail. So, caloric density is not that high, due to water weight, about 100-140 C/oz. Drying bacon is difficult due to the high fat content. The fats after frying (or trying)are very tasty for cooking fish(a source of tape worms,) eggs, in soups & stews and wrapped around hot dogs(pan broiled,) in beans, et al. Cholesterol is high, but I believe that this is only a symptom of somthing else going on in your body and only a secondary cause of heart disease and plaques. . .debatable. Anyhow, I believe working it off while hiking causes no real problems. >I prefer to carry bacon uncooked on the trail. James, How long does bacon keep uncooked on the trail? We are looking at 2 weeks in the Sierras. "James, How long does bacon keep uncooked on the trail? We are looking at 2 weeks in the Sierras." Well, this depends. Modern bacon does not contain quite as much salt as it used to traditionally. So, there are several methodes that will work. Usually my trips are somehat less than two weeks out, though. Open a package and liberaly salt each slice before placing it in another baggie. Generally I have no problems with this up to a week or ten days so, I am guessing it would last about two weeks or longer. Cooking still needs to be done, of course. Salt solutions (in bacon, ham, corned beef, etc,) do the preserving. The goal is about 15-20% salt to meat. Bacon has already been preserved, as is ham, and corned beef. Adding more is just insuring the manufacturors did the job corectly. Try to find bacon, salt pork or ham that has no BHA or nitrates in them. In every case the fats are valuable energy sources on the trail and largly ofset the weight of water they contain. Fats do not dry well…salt prevents them from becoming rancid so you can use this methode, too. Sausages, pepperoni, salami, etc are pre-cooked. Again, cooking and preserving are two distinct processes. Paraified butter, olive oil, even bacon grease can also be bottled and carried to add to cooking. I usually look for salt while hiking, since I sweat it out. So, adding lots to foods is normal. Dried beef is often too salty, but small amounts of this taste real good. Protiens are a bit more difficult, but preserving meats seems to pull the protiens (at least some of them) out making them a bit easier to digest. Suggest you look up preserving meats, pickling, and canning methodes. (You can do canning with boiled vacuume bags for the trail.) All these methodes will last for at least two weeks. Drying (dehydrating) is also good, but another sibject. Pickling, in particular, is salt based preservation. Often vinegar (spoiled wine) is added. Sounds like he is living dangerously. Most western countries you can get away with it, but… Neither temp is fatal to trichonosis worms. Less than 5 cases of trichinellosis reported in the US every year, are you really worried about this? I would worry about hypothermia and dehydration. Keyboard warriors are the biggest health threat in history. Even if you are diagnosed it is a simple surgical cure, much unlike lymes, dengue, malaria, carpal tunnel…. "Less than 5 cases of trichinellosis reported in the US every year, are you really worried about this? I would worry about hypothermia and dehydration. Keyboard warriors are the biggest health threat in history." I don't worry about it at all. I cook my pork. If we all decided to do pork at 70F for 24 hours I wonder how that number would change? The point is, I do not need to get the disease if I know how to prevent it. I don't need to become hypothermic because I know how to dress myself. I do not need to become dehydrated, because I know enough to drink water. 95°F sounds like a pretty optimal temperature to grow bugs harmful to humans. Maybe they should try 98.7°F for 19.5 hours next time, just to really get the bacteria count up. Yes, trichinosis is quite rare, but get your facts straight before you tell people that they are being ridiculous for following CDC recommendations. In heavy infestations it can cause encephalitis, myocarditis and even death. Surgery does not cure inflammation of the heart or brain. Trichinosis is not just a gastrointestinal illness, it is a serious disorder. I would become a vegetarian if undercooked pork was my only choice in meat. Bacterial, mold, worms, pretty much everything grows well at this temperature. Man, all this bacon talk has me fantasizing about busting out some of that Costco pre-cooked, 3 days into a Sierra trip. Would a mini-riot ensue? Does this now mean I *do* need that Rambo knife in my kit? Then, there's the thick cut bacon jerky idea. OMG, as they say. Hmmm. One thing though with the Trichinosis and CDC references: "Successful trichinae control programs by the U.S. pork industry have nearly eliminated the disease in domestic swine raised in confinement" (CDC) and all the reported cases in the last 5 years have been from meats outside the commercial pork industry, ie wild pigs, fish and such. In the USA, big corporate has taken care of the trichina worm. Ergo, you might go to New York City and order "Bacon Tartare" from Bobby Flay. Things do change. I have eaten rare pork a number of times at fine dining establishments. I am not saying trichinosis is a laughing matter, I know I am putting myself at risk eating it. I am also putting myself at risk eating taco bell, fresh mayo, cookie dough, lettuce and scores of other food products. It is just not high on my radar due to the quality of pork I am eating.